Let’s assume that you have some really important work documents that you don’t want to fall into the wrong hands (evil rival company or some such thing). Or maybe you wrote a ton of nasty notes about your relatives—who all happen to be super hackers. And water doesn’t work. A hard drive stores information on a platter which looks a lot like a CD. It can be made of aluminum, ceramic, or glass. Wetting the drive will definitely short out the electronic components, but the data on the platter will still be intact. So it’s kind of like turning off the lights in order to prevent someone from reading a book—all you need to do is turn the lights back on. 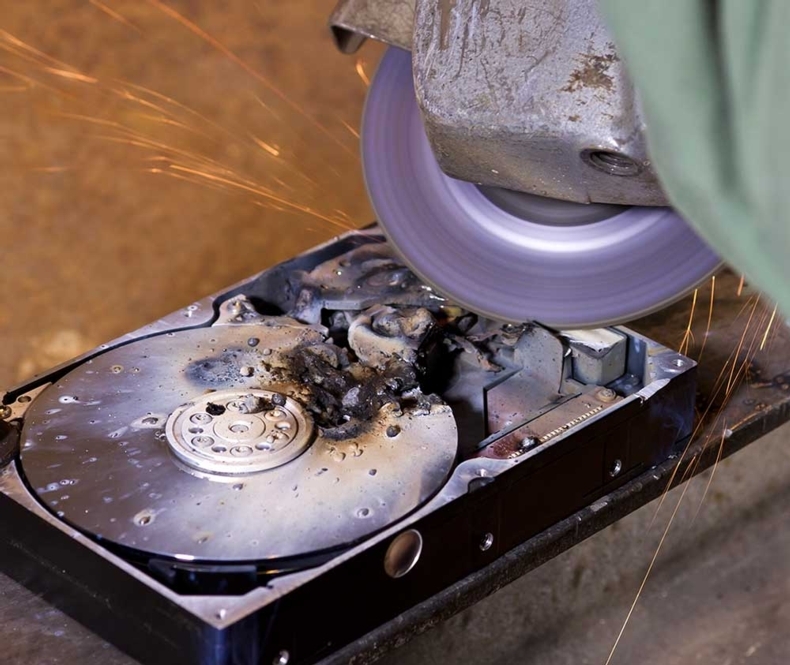 “The data’s still on the platters, regardless if they got wet or not,” says Russell Chozick, vice president of a data-recovery firm, Flashback Data, in Austin, Texas. He further explains that, as long as the platters are not allowed to develop an encrusting film of grime on their surface upon removal from the water, any data stored on them can be retrieved easily by forensics experts. So, if not water damage, what would be the best way to ensure that a hard drive’s information is completely irretrievable? Magnets seem like a good choice however, they aren’t up to the task. The best method, according to the experts (the only 100% effective guarantee), is to physically damage or destroy the platter. “… if you want a guarantee, shredding the platter is the safer way to go,” states Gleb Budman, CEO and co-founder of a cloud storage company that uses consumer-grade hard drives with which it built its servers out of, called Backblaze. Using brute force to shatter a platter works well enough; so does using a drill to puncture holes into it. If violence is not your preferred method, acid works just as well, if not even better. Do note: There is a right was and a wrong way to beat the heck out of your hard drive. Burning is not the best choice, as it releases a number of chemicals. So if you use acid or fire, be sure to use a mask and gloves. You could microwave it, but that would take a long time and could very well ruin your microwave. Sanding it is a pretty sound choice. But for those who just cannot be bothered to go through all the physical motions, most operating systems already come with utilities to wipe a drive clean. However, as a number of recent hacks highlight, there is generally a way to retrieve data, even after it has been removed—it must be destroyed, literally. Can You Tell This CGI Skin Apart from Actual Skin?